Benjamin Bloom developed a taxonomy for goals in education, and frankly: One of the most asked questions I received is ‘is Bloom correct’. 1. The triangle does not appear anywhere in either Taxonomy. The triangular representation was quite likely designed by someone as part of a presentation made to educational practitioners (e.g., teachers, administrators). I believe that the triangular representation was developed in order to indicate that, in the original Taxonomy, the six categories formed a cumulative hierarchy. That is, it was believed by the authors of the original Taxonomy that mastery of each lower category was necessary before moving to the next higher category. For example, you have to comprehend something before you can apply it. 2. The triangular representation of the revised Taxonomy is particularly inappropriate for several reasons. First, the revised Taxonomy contains two dimensions, not one. The authors believed that knowledge was sufficiently important to be a separate dimension. They also believed there were different types or forms of knowledge: factual, conceptual, procedural, and metacognitive. Second, the nouns in the original Taxonomy were replaced by verbs, In this process, remember replaced knowledge at the lowest “level” of the second dimension, termed “cognitive processes.” If you read the text of the original Taxonomy, the equation of “knowledge” with “recall” and “recognition” is quite evident. Remember was followed by understand, apply, analyze, evaluate, and create. Third, the categories (verbs) in the cognitive process dimension did NOT form a cumulative hierarchy. Rather, they were considered to be “tools in a toolbox.” Thus, it was possible (and often quite useful) to apply in order to understand or to evaluate as you apply. 3. 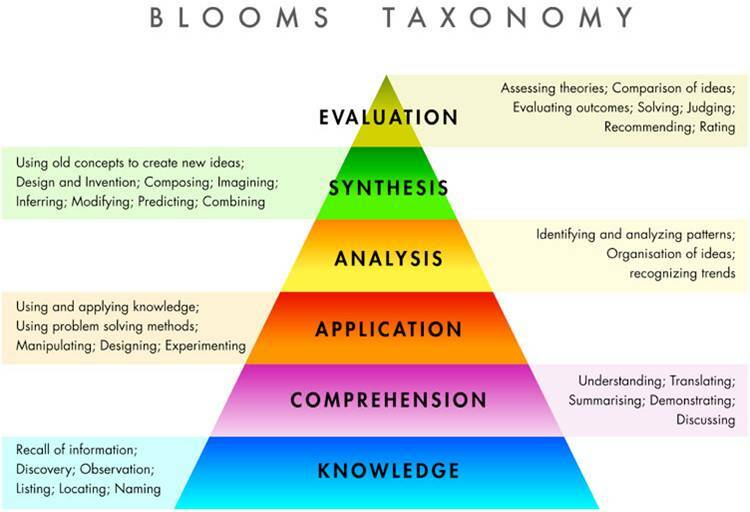 In your blog post, Dylan William’s representation, entitled “Bloom’s taxonomy, as it should be” is a far better representation of the revised Taxonomy than the triangular representation. In fact, if you change the nouns to verbs (other than knowledge), add Remember to the list in the upper row, and realize that knowledge is multi-faceted (as I mention above) he has almost reconstructed the two-dimensional table of the revised Taxonomy. 4. Finally, after 40+ years in the business, I am greatly dismayed that many educators get their information from oral presentations and secondary (and in some cases tertiary) sources. This practice tends to result in passing along half-truths and misinterpretations. In this regard, I think you could do a great service by directing the readers of your blog to original sources (even if they won’t read them). With respect to the revised Taxonomy, it would be helpful for anyone who is interested in writing about or making presentations on the revised Taxonomy to take 15 to 20 minutes to read the excellent overview written by David Krathwohl in the journal, Theory into Practice. Taxonomy is the practice and science of classification. The word is also used as a count noun: a taxonomy, or taxonomic scheme, is a particular classification. The word finds its roots in the Greek language τάξις, taxis (meaning ‘order’, ‘arrangement’) and νόμος, nomos (‘law’ or ‘science’). Originally, taxonomy referred only to the classification of organisms or a particular classification of organisms. In a wider, more general sense, it may refer to a classification of things or concepts, as well as to the principles underlying such a classification. Taxonomy is different from meronomy which is dealing with the classification of parts of a whole. panorama of the range of educational possibilities against which the limited breadth and depth of any particular educational course or curriculum could be contrasted. But if you check the revised version e.g. in the work of David Krathwohl from which I also took previous, than this isn’t the case anymore. to what extent is this taxonomy – by definition a simplification – correct? how useful is this taxonomy? I for myself was trained in another taxonomy by De Block and Heene, who has 3 dimensions. Bloom’s work is more well known all over the world. Both taxonomies are a tool to help teachers think about their lesson objectives in education and to help them not to get stuck in one type of goals or not to overlook other goals. It’s true that Bloom suggests some elements that don’t match with reality as we know from cognitive psychology. But again… as Anderson describes: this is often because other people adapted the theory. I’m with Anderson on this for the time being. I also like the version Dylan William shared. But if you need to use them? I suggest to look at the 2 criteria I just gave you. Great words about education and didactic hierarchy.